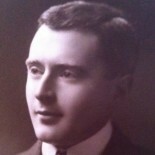 Halliday Gibson Sutherland (1882-1960) was a tuberculosis pioneer, doctor and author. His obituary in the British Medical Journal described him as “a tenacious fighter for the principles he thought were right, whether medical or political.” He publicly spoke out against eugenics, a stance which led him into a bitter legal battle against the eugenist, Marie Stopes. Want a quick summary? Click here. When Sutherland chose to specialise in tuberculosis in around 1908, the disease killed 70,000, disabled 150,000 and infected 500,000 people annually in Britain. When it struck the bread-winner, whole families would be thrown into pauperism. Sutherland was pupil and protégé of Sir Robert Philip, and he implemented many of Philip’s schemes. He produced Britain’s first health-education cinema film and started an open-air school in the bandstand in Regent’s Park. There were obstacles preventing the eradication of the disease, such the poor living conditions in the urban slums of Edwardian Britain. The biggest obstacle however, was eugenics. Modern eugenics was born. Mainstream eugenists held the view that it was a person’s heredity rather than their environment that determined their quality. Social standing was seen as indicating a person’s fitness for their environment. Given their belief that nature was the predominant factor, they concluded that the trend would lead to “national deterioration” and even “race suicide”. The link to tuberculosis was this: the disease affected the lower classes three to four times more than their social betters. The mainstream eugenist thought that the disease formed a natural check on the progeny of the “dregs” of society—in other words, it killed them before they could reproduce. To mainstream eugenists, tuberculosis was a literal and metaphorical “weed-killer”. The Stopes v. Sutherland libel trial. Dr Marie Stopes was famous as the author of Married Love. Stopes was a member of the Eugenics Education Society (“EES”) and had become increasingly frustrated that it would not adopt her birth-control agenda. To her, the way to combat what she called the “social evil” of the differential birth rate was to provide contraception free-of-charge for those who sought it, and to compulsorily sterilise those who did not. In 1921 she became a fellow of the EES, opened the “Mother’s Clinic” (with her husband, Mr Humphrey Roe) in a poor part of London, and established the Society for Constructive Birth Control and Racial Progress. Barr became a Vice-President of her Society for Constructive Birth Control and Racial Progress. Stopes lobbied the government for controlled breeding and compulsory sterilisation of those she considered unworthy of parenthood. The groups Stopes nominated for sterilisation were not only wide-ranging, but were described in disparaging terms that were at odds with her scientific background. Stopes ordered an advance copy of the book and was reportedly incensed by a passage headed “Exposing the Poor to Experiment”. Through her husband, Stopes challenge Sutherland to a public debate. He did not respond, on the grounds that he did not want to promote her cause, and subsequently he received a writ for libel. On 21st February 1923, Stopes v. Sutherland opened in the High Court. The defendants—Sutherland and his publisher—successfully defended the action. Stopes appealed and won. Sutherland appealed to the House of Lords, the highest Court in Britain, and won in 1924. In 1933 Sutherland’s book The Arches of the Years was published and became an international bestseller, making the Publishers Weekly list for that year. …a born writer, especially a born story-teller. Dr. Sutherland, who is distinguished in medicine, is an amateur in the sense that he only writes when he has nothing better to do. But when he does, it could hardly be done better. Sutherland continued to oppose eugenics in his 1935 book The Laws of Life. In 1936 he wrote about a the “lethal chamber” in The Perfect Eugenic State, foreshadowing the appalling discoveries that would be made later in the century. The Magdalene Laundry at Galway. Permission to visit was granted on the basis that anything he wrote be vetted by the Mother Superior of the Laundry. Accordingly his 1956 book Irish Journey was censored. Following the discovery of the publisher’s manuscript in 2013, the uncensored manuscript is available for the first time, exclusively, on this site. Followers and advocate of eugenics are sometimes called “eugenicists” and sometimes “eugenists”. Which is correct? The answer is that both are. I notice that in modern times, people tend to use eugenicist. I prefer to use the term “eugenist” on the grounds that it has fewer syllables and that it was the term used by Dr. Sutherland and Professor Karl Pearson, Professor of Eugenics at London University. Blog articles are posted on the first day of each month (except in April when the article is published on the 2nd). Header quote: “Documents of the Twentieth Century” by G. K. Chesterton “The Listener” December 12, 1934. Acknowledgement and thanks to Dale Ahlquist, President of the American Chesterton Society for bringing this to my attention.